RVers know how helpful technology can be when traveling. However, do you know how many apps are on either the Apple or Play store that are aimed at RVers – a ton! Escapees RV Club listed their top 16 must have mobile apps for RVing. The free Google maps application is almost a no-brainer to have handy on your phone. It can replace your paper map altogether while helping you find destinations and businesses along the way, and provides directions, all with the ease of turn-by-turn navigation. We highly recommend the use of Google Maps over Apple maps for more accuracy. Created by campers for campers, Campendium has tens of thousands of places to camp. From RV parks to free remote destinations, vetted by a team of full-time travelers and reviewed by 70,000 plus members. Campendium is free to use and it will change the way you find place to call home for the night. Waze is the world’s largest community-based traffic and navigation app. Join other drivers in your area who share real-time traffic and road info, saving everyone time and gas money on their daily commute. This app can help you avoid traffic by being alerted of upcoming road hazards, traffic jams or accidents that are all shared by other drivers. You can also view notes from the report such as how long others have been waiting, how fast the traffic is moving and what the exact situation is. GasBuddy lets you search for gas prices by city, state, zip code, with listings for all cities in the USA and Canada. The prices are updated in real-time and show the time it was located, allowing you to fill up on the cheapest gas near you with ease. Need to find a shop that sells RV parts? Not sure where to eat for dinner? The Yelp app is a great way to find businesses and restaurants near you. You can read and write reviews, get directions, and even view menus and photos! The WeatherBug app makes it easy to view the forecast up to 10 days in advance, which may be very helpful when planning ahead for your next destination. View interactive weather maps, live weather cams, and also view severe weather alerts in areas you might be traveling to. iExit helps you find the best exit ahead on the highway for all your travel needs. The app automatically locates you on a highway and lets you look hundreds of miles ahead to discover spots at upcoming exits. It can be quite frustrating depending on utilizing highway signs to find your next stop so this will help you save time by planning ahead, whether it’s finding somewhere for gas, food or even free Wi-Fi! One of the great things about RVing is that you find new things in every town, which could potentially lead to several loyalty cards to different stores (especially grocery stores) in order to receive discounts. Those pesky cards can fill up your wallet quickly, and this handy app helps you avoid an overstuffed wallet. On top of storing all of your cards in one place, it has coupons for over 15,000 retailers that you can redeem right from your phone. 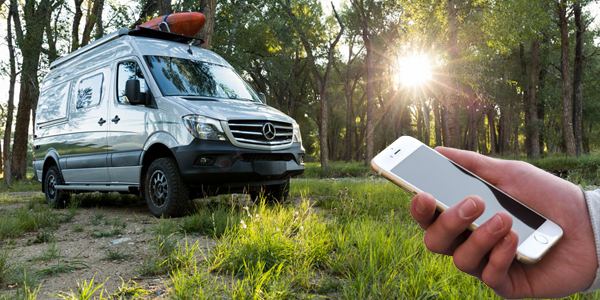 Having trouble with your MiFi card or finding that the Internet in your campground is unreliable? With over 550,000 locations in 144 countries worldwide, this app can help you find free or paid Wi-Fi locations around you. This app works both online and offline and gives you hotspot details, location, and also gives you directions using GPS. Every RVer can utilize this app, but it is a lifesaver for those who heavily rely on good internet signal for work. This is especially great for those who use multiple carriers because you don’t have to flip back and forth between sites. This app contains regional level maps based off of each major carrier’s data map – as found on their website as of our last update. Quickly overlay the carriers you use to create your own personalized coverage map on your device. SatFinder will easily help you set up your satellite dish each time you move to a new location. It finds your location based on GPS and displays results both as numeric data and graphically on Google maps. This is a great resource for any beer lover! Discover new locations along your travels by utilizing the app to find nearby popular bars and beers. Sometimes it can be hard to find or decide on which local brewery to visit, and this app makes it easy by showing ratings of bars around you and what’s being poured there. You can also share what you’re drinking and where with other beer lovers around the world! AllTrails is one of the best ways to discover hiking, running and biking trails near you. You can explore 50,000 hand-curated trail maps plus reviews and photos crowdsourced from millions of users. You can also filter between dog-friendly or kid-friendly destinations. Save your favorite trails, record your adventures and count your calories all within the app. Never miss another quirky attraction around you! This app specializes in showing you unusual and funny places along the highway. This is a great way to find new adventures during your travel days or locate something in an area you’re staying in. RVillage is a social platform built specifically for RVers. Within this app you can customize your profile, update your location, find others around you, create a get-together, talk with people in the news feed, share photos and much more!